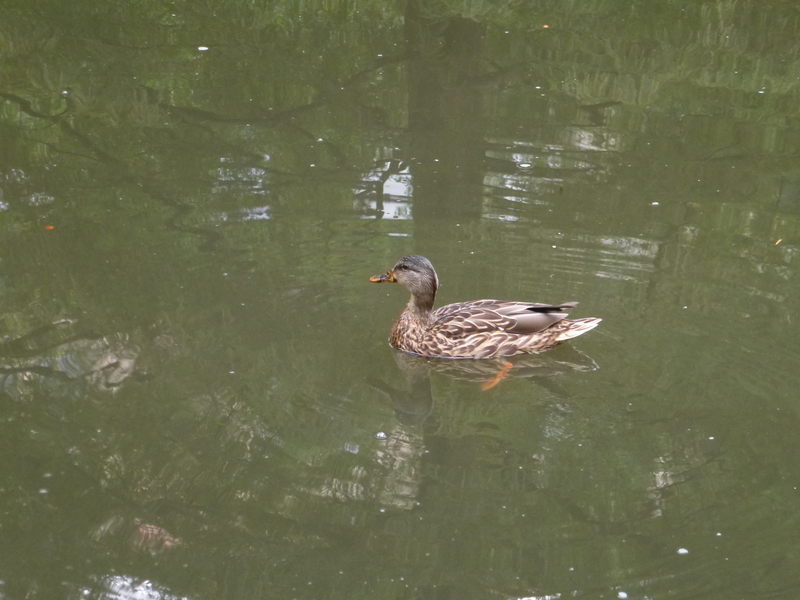 Well, after a day’s absence, my beloved mallard hen Honey returned to Botany Pond (sans her swain James Pond) this morning. I went out to the pond, not whistling because I didn’t see her. 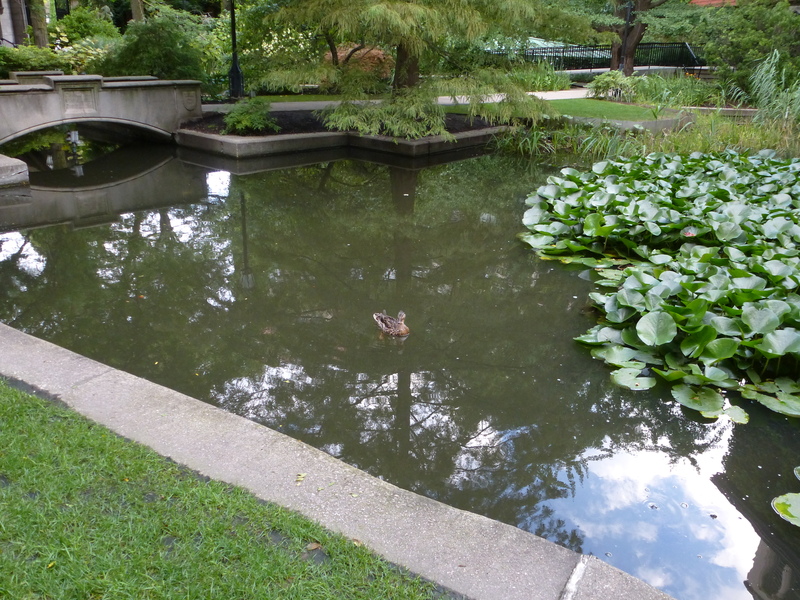 I stood by the pond for a while and saw no duck anywhere, and then, as if out of nowhere, a small feathered creature came steaming towards me. Honey had returned! She’s on a one-day-on-one-day-gone schedule, and I have no idea where she goes. But I’m pretty sure she returns for food, as she needs to fuel up soon for her big migration. She looked in good nick, and ate a huge meal (and she just did at lunch, too). She was starving. As I said, I don’t know where she goes, but Anna and I are happy to have her back for at least a day longer. I’ve never seen her so hungry, and I wonder what this is about. Here she is nomming mealworms. Note that her wing feathers are fully grown, and the right wing is still crossed over the left. I suppose that asymmetry is permanent. 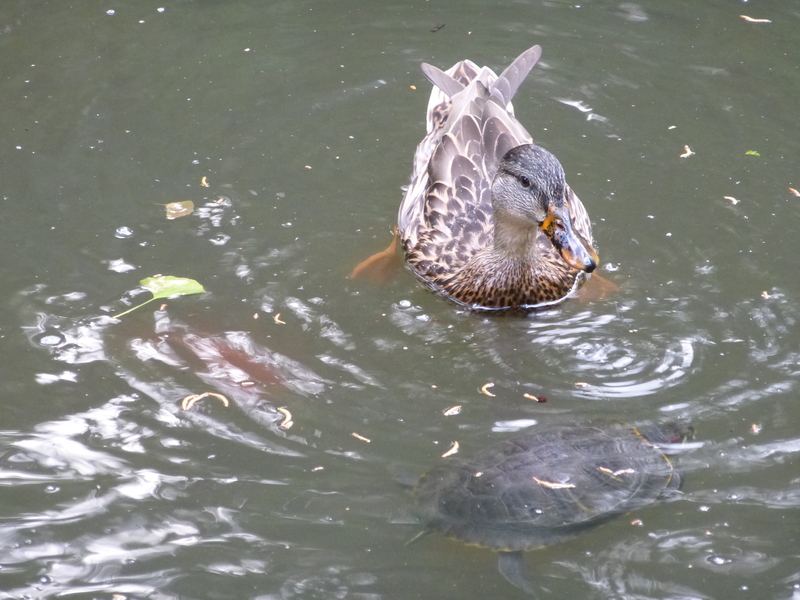 The turtles compete with her for the mealworms, but she’s a lot faster than they are. Here’s a 2:40 video of Honey doing her postprandial ablutions. As usual, she’s standing on the ring of the cement “bathtub.” I don’t know what this repeated head-ducking is all about; maybe that’s why they call them “ducks”! Note that at 0:37 she removes a down feather from her breast (I suppose she’s still molting), and she wags her little tail continuously. There’s a big wing flap at 2:09. I have more photos of her from this afternoon, but will save them for later, as I never know when will be the last time I see her this year. This entry was written by whyevolutionistrue and posted on August 30, 2018 at 1:00 pm and filed under ducks. Bookmark the permalink. Follow any comments here with the RSS feed for this post. Both comments and trackbacks are currently closed. Where does Honey winter? Her metabolism must be telling to eat up for the trip. I love the little shake of her tail she gives after each worm. Looks like pure joy to me. 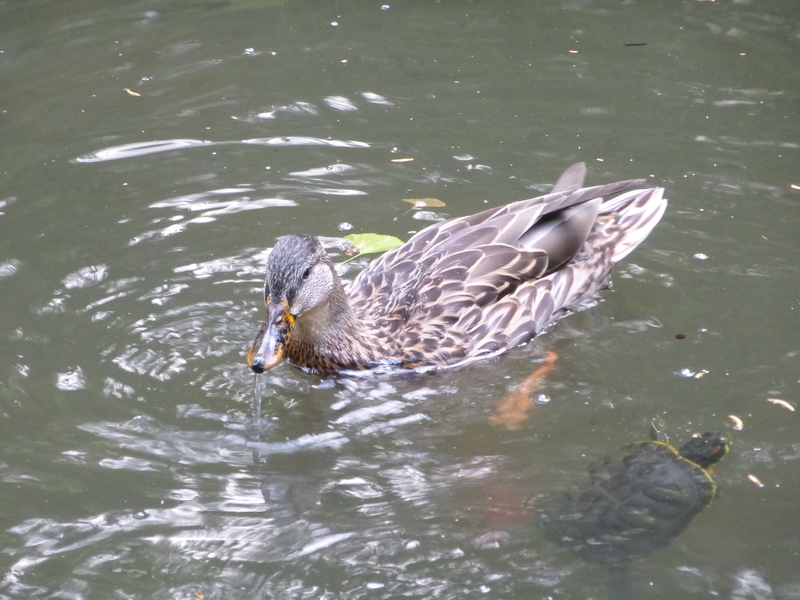 Of course it might just be a reflex to shake the water off her tail feathers after each dip. I think the head dipping is to get water on a duck’s back. I hate to make this suggestion, but is it possible that your daily feeding is keeping her from starting her migration? Perhaps she’s so hungry when she returns to the pond because there’s very little other food available in the neighbourhood, and if wasn’t for your daily handouts she’d be on her way south by now? Not likely. She left last year on September 1 after daily feedings, and they don’t really head south until it freezes (I suspect she’s going elsewhere to commune with other ducks). Nobody’s migrating right now, and remember that all her brood left, too, even though they were getting fed. I don’t think she’s quite through with her molt, as a few feathers are still being shed. Her behavior this year is exactly as it was last year: intermittent leaving and returning before the final exist. I think ‘duck’ and ‘ducking’ pertain to ducks’ behaviour of ducking down into grass or behind other objects to hide from predators. I’ve observed this behaviour many, many times from the Mallard ducks that visit my garden in the spring, year in and year out. I’ll go out to the garden, sometimes not realizing they’re there, and then I’ll spy them ducking into the grass and shrubbery. If I go about my business without getting too close to them, they’ll emerge and cautiously move about. I think you should keep whistling every day, until you’re sure she’s gone. I think I’m in love with a duck! What’s the constant noise in the background? Is it traffic noise? I don’t think I could live like that! I was wondering that, too. Seems too uniform for traffic. No, it’s the outlet for the water that is pumped into the pond (it’s filled and drained continuously), and the noise really isn’t as bad as it seems. I think the camera is oversensitive to sound. If it’s the water it’s probably a nice sound in reality.